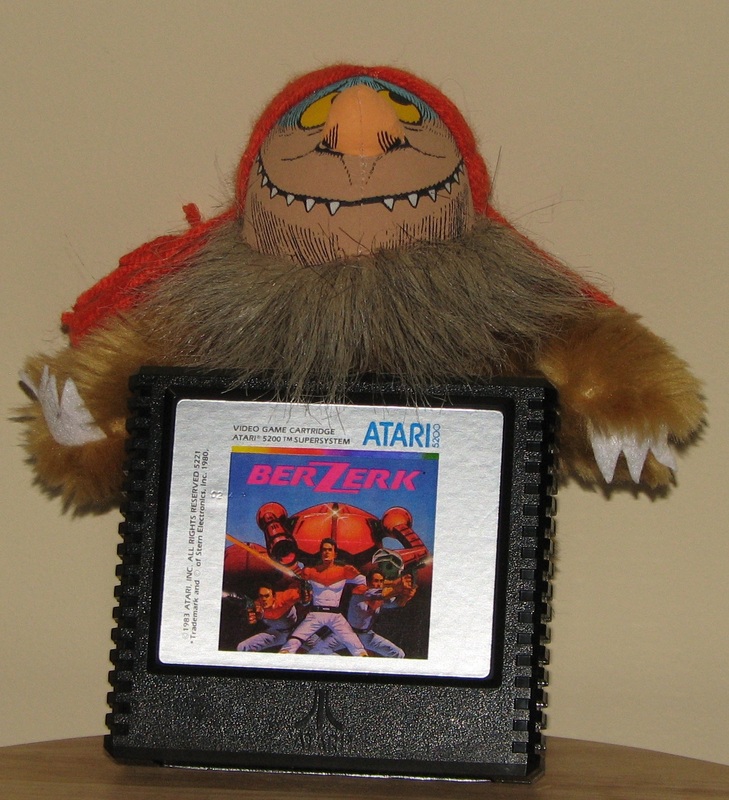 Berzerk is a 1980 video game developed by Stern Electronics of Chicago. Supposedly Alan McNeil, the designer of Berzerk, had a dream about a black and white video game involving fighting robots. During the development of Berzerk, Defender was released and the decision was made to release Berzerk in color instead of B&W. A few early units were, supposedly, released in B&W with color overlays. The color units were produced in two distinct batches with the second batch having more variety in the colors of the robots and the number of bullets that they fire. The Berzerk arcade systems are based around a Z80 CPU and it is one of the first video games to feature speech synthesis. This may not seem like a big deal in 2013, but it was really amazing in 1980. The first time anyone played Berzerk, they had to be amazed to hear the game talk to them! The concept of Berzerk is pretty simple…the player is a humanoid in a maze with a bunch of killer robots. To survive, you must shoot the robots before they shoot you. You also have to avoid running into the robots, the electrified walls, and Evil Otto. Evil Otto adds a significant amount of complexity to the game as you must avoid him as you can not kill him. Alan supposedly named Evil Otto after the security chief at a previous employer. The robots in Berzerk are not the ‘sharpest tools in the shed’ as they have a tendency to kill themselves by running into the walls or each other. Although the concept of the game is simple, players would find themselves putting quarter after quarter into the game. Berzerk was the first popular ‘shoot em up’ video game and all of today’s popular shooter games can trace their roots back to 1980. 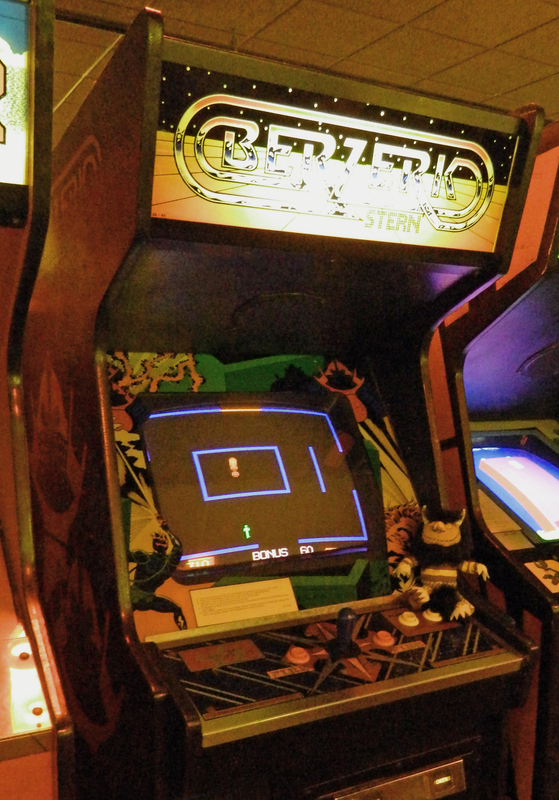 Berzerk was ported to the Vectrex and the Atari 2600 and 5200 consoles. At least in Frenzy, it is possible to kill Evil Otto. Frenzy was ported to the Colecovision, but not to any Atari home consoles. 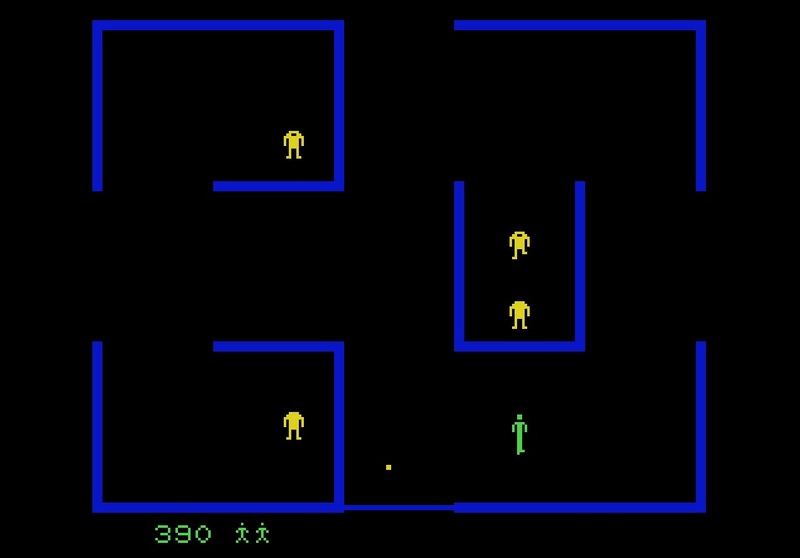 The 2600 version of Berzerk was released in 1982 and was a smash hit. Berzerk’s simple graphics were faithfully replicated on the 2600 and the game play was almost identical to the arcade. Atari included 12 variations including ones with and without Evil Otto, non-shooting Robots, and even one where Evil Otto can be shot and will disappear for a few seconds. I fondly remember playing Berzerk over and over on my Sears Video Arcade (Atari 2600) in the early 80′s. It is a fantastic game and there was something cool about the green label and box. There was one big thing missing, however, from Atari’s 2600 version…voice synthesis. Back in 1982, most of us figured that this just could not be done on a 2600. In 2002, Mike Mika proved this wrong when he developed an improved version of Berzerk featuring voice synthesis. In ‘Berzerk Voice Enhanced‘, Mike also improved the graphics to make them more closely resemble the arcade. At various points in Mike’s version you will hear ‘intruder alert!’, ‘chicken, fight like a robot’, and ‘humanoid must not escape’. Berzerk is a great game for the 2600, but Berzerk VE is an outstanding game that belongs in every 2600 collection! The 5200 version of Berzerk was released in 1983 and became an instant classic. Like its 2600 cousin, the 5200 version faithfully replicates the arcade graphics and game play. The 5200 version takes it to the next level, however, and features full voice synthesis. Mike’s Berzerk VE for the 2600 is pretty awesome, but the 5200 version is one step better. The voice synthesis is tied to the game play so that when Evil Otto is about to appear, you will hear ‘intruder alert!’. The 5200 port is one of the best arcade conversions in the 5200 library and belongs in every 5200 collection. The only thing missing is a coin slot and ‘coins detected in pocket’. Sadly, no 7800 version of Berzerk was developed. Until this week, 7800 fans had to settle for playing the 2600 version of Berzerk or Berzerk VE on their 7800. This coming weekend, at the Portland Retro Gaming Expo, everything changes as Berzerk/Frenzy will be released for the 7800 by AtariAge. The latest game(s) from 7800 master programmer Bob ‘PacManPlus’ DeCrescenzo, will be released with a full color box and eight page manual. Bob has managed to pack both Berzerk and Frenzy into a single 48K, non-bank switched cart. Even more amazingly, the games feature voice synthesis for an authentic, arcade quality experience. If that wasn’t good enough, Bob includes two player versions of the games as well. Having tested the latest release candidate for these two games, I can say that Bob has done a fantastic job! For those lucky enough to be in Portland this weekend, be sure to pick up a copy for your collection. For those of you who can’t make it to Portland, don’t worry, Berzerk/Frenzy will soon be available in the AtariAge store. One really cool note that I should add is that Alan McNeil was an adviser on this project and assisted Bob with tips and ideas for the games. Thus, Bob’s 7800 versions are as close to the arcade originals as possible, given the constraints of the 7800. Berzerk is now available for all three Atari systems and there is no bad version. If you have a 2600, go for the Voice Enhanced version as the voice really makes this game. The 5200 version is one of that console’s best arcade ports and belongs in every library. For 7800 fans, Bob’s Berzerk/Frenzy is destined to become another classic that fills a void in that console’s library. No matter which console you have, Berzerk belongs in your collection. If you are lucky enough to have a 7800, you will absolutely want to get a copy of Bob’s new game! Categories: 2600, 5200, 7800, Atari, Game Reviews | Tags: 2600, 5200, 7800, Atari, Berzerk, Frenzy, VCS | Permalink. Released by Atari in 1982, the 5200 was intended to compete with the Intelivision system, but also ended up being Atari’s answer to the Colecovision. Atari had attempted to develop a system to replace the 2600, called the 3200 (based on a 10-Bit CPU). This system was difficult to program and was cancelled. Needing a solution in a hurry, Atari took the design of the their 400/800 computers and made that the base of the 5200. The 5200 has unique controllers with a keypad and analog, non self-centering, joysticks. These controllers are notorious for failing and contributed to the limited success of the 5200. The other limiting factor was that it was not backwards compatible with the 2600. Eventually an adapter was released, but it did not work with early versions of the 5200. This is too bad as the 5200 is actually a pretty awesome game machine and has arcade quality graphics and sound. The 5200 is powered by 6502 8-bit CPU running at 1.79 Mhz. It has 16 KB of ram and 2 KB of rom and can accept cartridges up to 32 KB without bankswitching. The 5200 also includes a Pokey chip that allows for 4 channel sound. Two different models of the 5200 were released. The early models had 4 joystick ports and a ‘high tech’ RF switch box. Later models had two joystick ports and a standard RF switch box. A few games (such as Pitfall) only work with the 4 port version and the 2600 adapter only works with 2 port versions and a few late release 4 port units. A total of about 1 million 5200′s were sold between 1982 and 1984, when the system was discontinued. The 5200 was not a commercial success for Atari and is typically rated low against other home consoles. Atari certainly made some marketing blunders, such as making Super Breakout the pack in game for the system (later, they would change it to Pac-man), and by not making it backward compatible with 2600 games. The controllers and their failure rate were also a major issue. The engineers at Atari developed better, self centering controllers and separate paddle controllers, but these never made it out the door before the system was cancelled. The amazing 5200 track-ball controller did, however, make it into production as well as the 2600 adapter. In order to review 5200 games for this blog, I purchased a 4 port 5200, a couple of Best Electronics second generation rebuilt controllers, and a trackball. In the past few months, I have really come to enjoy my 5200! Back in the 80’s, the knock on the 5200 was that the games were just the same old arcade ports such as Dig Dug, Galaxian, and Kangaroo. Today, these arcade ports are the strength of the 5200’s library. The 5200 controllers are still analog and non self-centering, but the issues with excessive failures have been mostly solved with upgrades from the folks at Best Electronics. The 5200 track ball is relatively easy to find and typically sells for under $40. Several awesome arcade ports such as Missile Command, Centipede, and Space Invaders are coded to take advantage of the trackball controller. The difference in playing these games with the joystick versus the trackball is significant. Although there have been a few great homebrew games developed for the 5200, there are not nearly as many as for the 2600 or 7800. the ones that have been released such as Adventure II, Tempest, and Castle Crisis are all really amazing additions to the 5200 library. Also, many complete or nearly complete prototypes that have been released such as Millipede, Jr. Pac-man, and Xevious fill out holes in the 5200’s library. Finally, many 8-bit games such as Caverns of Mars, Donkey Kong, and Demon Attack have been converted to run on the 5200. The 5200’s official library was only 69 games, but homebrews, prototypes, and conversions, take the 5200’s library to over 200 games today! It is a shame that Atari cancelled the 5200, after only two years on the market, and it is almost criminal that they held back several completed games. It is also too bad the the updated, self centering controllers never made it into production. 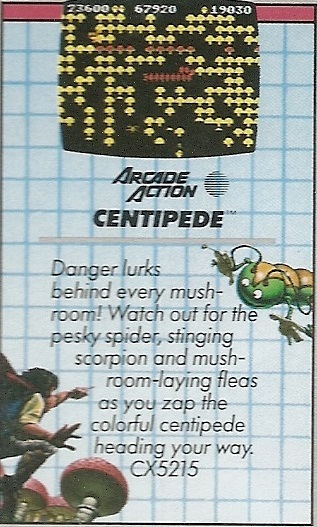 However, if you really like 80’s arcade classics, playing games like Centipede (with the 5200 trackball) is about as close as you are going to get without finding a real arcade machine. The Atari 5200 is a pretty awesome game system and, if you have previously discounted it, you should give it a second look! Categories: 5200, Atari, System Reviews | Tags: 5200, Atari | Permalink.